Back in 2014 I noticed for the first time that different devices charge at different rates on the same charger. 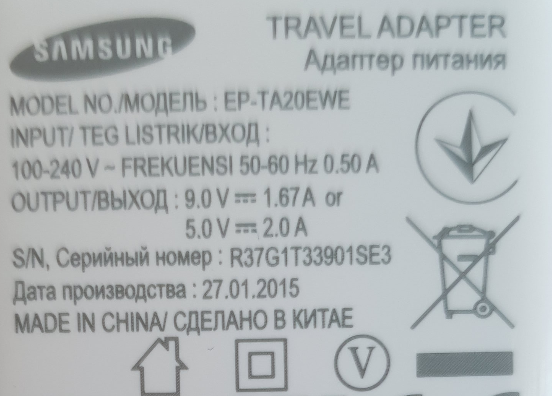 At the time I had a Samsung charger that could supply 5 V and 2 A and even then, devices such as the Samsung Galaxy S4 made good use of it by drawing 1.6 A. A bit down the road, a new device I bought came with a power adapter that could either supply 2 A at 5 V or 1,67 A at 9 V. So do devices I have actually make use of this? 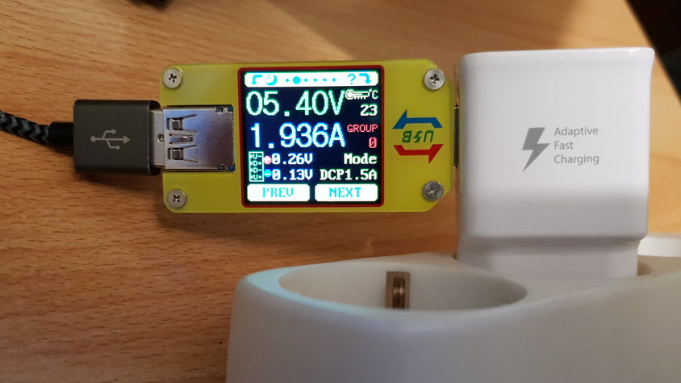 To find out, I bought a new USB charging tester, the ‘yellow’ Innovateking-EU UM34, that is specified up to 24V. There are two versions of the device, the UM34 for around 22 euros and the UM34C for a few Euros extra that includes a Bluetooth interface to send measurement values to an app on a smartphone in addition to showing everything on its color display on a number of sub-pages. And indeed, my Samsung Galaxy S9 makes good use of the 9 V capability of my charger. After the phone is plugged into the charger, it stays at 5 V for a few seconds and then changes into the 9V charging mode and draws around 1.1 A. In other words, it charges at 10 W.
In theory, this can charge the battery in a little bit over one hour if it didn’t have to slow down at the end to prevent damaging the battery. In practice I observed that the charging rate starts to drop at around 75%. The charger can supply up to 1,67 A at 9 V so I was wondering why the S9 limits itself to 1.1 A!? After all 9 V at 1.1 ampere is pretty much the same as 2 A at 5 V that other devices such as my Lenovo tablet draw out of the charger. So why go to 9 V? Perhaps the charging process is more efficient at 9 V? No idea, but one definite advantage is that the S9 happily draws 1,4 A out of the charger if the screen is switched-on while charging and power intensive activities are done such as scrolling down a web page. This means that the S9 is quite aware of the charger’s capabilities but chooses limit battery charging to 10 W. One odd thing I noticed is that LineageOS on the S9 behaves differently to Samsung’s stock android. While Lineage always stays in 9 V mode and increases the power draw, the Stock Android falls back to 5 V and reduces the power draw as soon as the screen is switched on. I tried with an S8 and saw the same behavior. I’m not sure why Samsung does this, perhaps to make sure the combined heat of charging, of running computing intensive tasks on the CPUs and the screen creating head doesn’t overheat the battery which would reduce its lifetime? 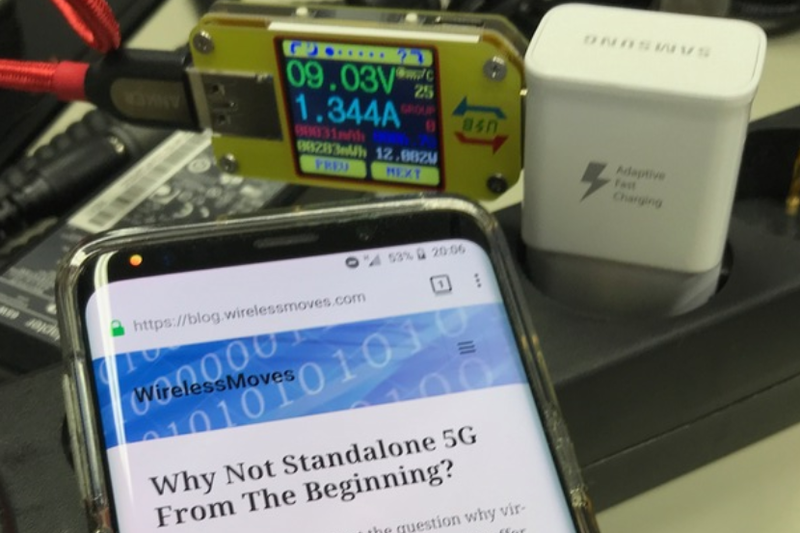 Next Next post: 5G – How Much Spectrum Do You Need To Make A Difference?